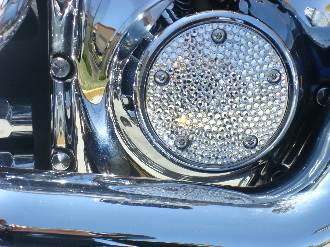 Bling out your Timing cover with clear Swarovski Crystals or color crystals of your choice to match your bike. Most of our customers want their parts to stand out and make a statement. Other parts available to be crystalized include: derby cover and shift linkage. Base price is for clear crystals. Additional cost for color crystals. If you prefer to have a custom design created, please email us to further discuss pricing. Price does not include part. Customer sends timing cover part in good condition. Or, we can order your part on customer's behalf for additional cost to be invoiced separately and paid prior to commencing project.